The interview with Paige was awesome; everything worked. She will now edit the recording before putting it “on air”. I’ll announce the details once I know them. For now, I would like to share how I, with cerebral palsy and a significant speech impairment, was able to give my first radio show! It is actually mind-boggling that this “non-verbal” red-head was able to do this. Paige sent me her questions ahead of time. I typed my responses into Microsoft Word. 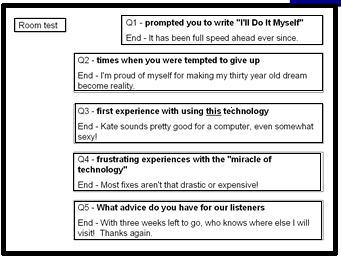 I copied each individual response into my text-to-speech software TextAloud and tweaked the text so that my computerized voice Kate reads it as accurately as possible. I saved each response as a separate wave file. I created one PowerPoint slide with links to each wave file; that way each response is only one mouse click away. In Paige’s online room used for recording, when it was time to give response, I hit the microphone button and then the appropriate link in PowerPoint. Above is a screenshot of the PowerPoint slide. Once the text box for each response was created, action settings were created (Action Settings > Mouse Click > Play Sound > browse for appropriate wav file); this links the wav file to the text box. Essentially, I created my own customized communicator. Any doubt why I was exhausted! Feel free to contact me for more information on creating a customized communicator using PowerPoint. This concept is so flexible and is only limited by your imagination! 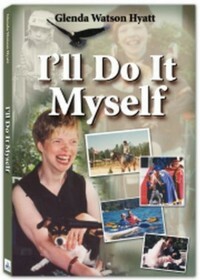 From a Speech Impairment to a Motivational Speaker: How Did I Get Here? Wow Glenda, What a great idea! Best of luck with the rest of your 40 Blogs in 40 Days Tour. Your are an inspiration to us all! Glenda, I’m so impressed with your perseverence and ingenuity! I’m honored to know you as someone who is always willing to do whatever it takes to get where it is she wants to go. Glenda, you were a joy to interview! I was VERY impressed by the PowerPoint file you created to help you through the interview and I can imagine Kate’s voice coming out of your mouth! All of us who were in the conference room live with you were inspired by your words and impressed with your ability to use technology to help you not only get through a live interview but to write your story and share it with the rest of us.As soon as I can get the interview edited, I’ll be getting it posted in my podcast schedule. Thanks again for being on Views from the Coop and best of luck on the remainder of your virtual book tour!